Kealive KL-K6 Coffee Pods Holder is specially designed to hold and dispense Nescafe Dolce Gusto coffee pods (or other pods with 2.12 inch diameter) conveniently. It can hold totally 24 pieces of pods, you don't need to annoy the pods in mess any more. Ideal for storing pods neatly within your kitchen. Including a 360 degree turntable round carousel at the bottom, capsules can be removed from above and below. Bright and sleek, ideal for decorative and indoor use, store the capsules neatly within your kitchen. Vertical design takes up minimal counter space, you can put it in the kitchen, living room, table or any corner of the room. Maximum Save Space: This coffee pod stand can hold 24 pieces of Nestle Nescafe Dolce Gusto coffee capsules totally, each row can put six pods, so you can store 4 different tastes of coffee pod in different grid. 360 Degree Rotating: Including a non-slip round carousel at the bottom, capsules can be taken from the top as well as the base effortlessly. 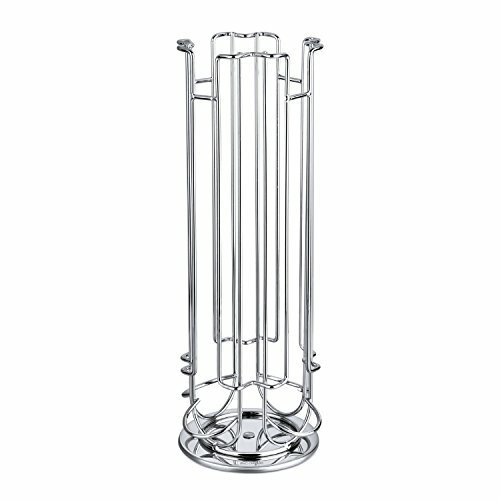 Brilliant Design: This coffee pod holder is made of high quality metal with a sleek chrome finish. it is bright and sturdy, also easy to clean. Easy to Storage: Vertical design takes up minimal counter space, you can put it in the kitchen, living room, table or any corner of the room. Package Contents: 1 x Kealive KL-K6 Coffee Pod Hoider, 1 x User Manual, 1 x 24 Months Warranty Card. If you have any questions about this product by Kealive, contact us by completing and submitting the form below. If you are looking for a specif part number, please include it with your message.